Yesterday I had a very shocking food experience. I took my girls downtown to the newly renovated Discovery Place Museum. I could have taken the easy route and packed a lunch for us, but I decided it would be more fun to go out for lunch (if we could in-fact find some real food). I had heard about this place called “Blynk” which is all organic and local and bla bla bla. I called them to inquire about their menu and as it turns out none of their breads or wraps are 100% whole wheat, they couldn’t serve my girls oatmeal (which I know they would eat) past the breakfast hour, and if we ordered one of the egg dishes it might not be as good without the bread that we couldn’t eat. Despite all of this, I thought we could hopefully find something on their menu and make it work. I packed some crackers, nuts, and raisins just in case I needed to supplement. As we entered the museum to buy our tickets my 3-year-old pointed to the museum cafeteria and said, “They have food here so we don’t need to go to a restaurant.” I replied, “Well, I doubt we can eat anything in a museum cafeteria.” Then I suddenly spotted the tagline under their “Community Café” sign that read, “healthy – local – green.” Hmmm… I added, “Well, maybe we can eat something here after all.” We went in to check out the menu and I got the shock of my life. In the past 2 months we have struggled beyond belief to order real food at restaurants and here at a little museum cafeteria we could actually choose from 2 of the ready-made items off a menu that was so small it only had 5 things to offer in the first place. It was absolutely unbelievable. I thought for sure my girls would want to share the whole-wheat cheese pizza, but for some reason they said they would rather have the burger. I didn’t really want a burger myself, but I felt like I should order one just because I could. Their burger was prepared with meat from Baucom’s Best 100% grass-fed meat (a local farm I’ve seen at our farmer’s market) and served on a whole-wheat bun. We asked for it to be topped with cheese, but of course had to hold off on the ketchup and sweet potato fries (although they did also offer eggplant fries which were of course deep fried and therefore still against the rules). 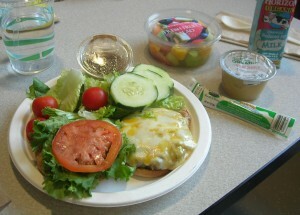 I divided the burger into thirds and supplemented our meal with some of their other fare, which included fresh fruit, organic applesauce, and organic cheese. All in all, it was an incredibly convenient and tasty meal. I never knew convenience and taste could coexist in a real food world. Thank you Discovery Place for making my day!! 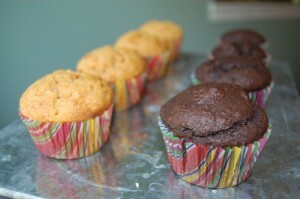 Today I had a very exciting moment when I suddenly decided to make chocolate cupcakes! I had a good excuse because I needed something as a substitute for the birthday cake that was being served at a party this evening. For as long as I can remember I’ve had an extrem ely big sweet tooth. While the chocolate tortes (shaped into balls) have kept me very happy for the last few weeks, this does happen to be the longest period of time that I’ve ever gone without eating chocolate cake (or any kind of cake for that matter!). So just the thought of making something like this sort of felt like Christmas to me…what can I say. And in case the chocolate cupcakes didn’t turn out that great I also made some carrot cupcakes as a back-up (both pictured without frosting). Once the first set of cupcakes were done, they looked and smelled just like regular chocolate cupcakes. If I said they tasted like them too I would be lying, but for someone that has gone so long without this sort of thing I have to admit that they totally did the trick for me. And let’s not just focus on what they did for me; my daughters were so excited about having these chocolate cupcakes that I honestly don’t think they even noticed the birthday cake at the party (that we were of course not able to eat). Their response couldn’t have made me more pleased. I do wonder though once the 100 days are over if I will continue to go through this much effort when we leave the house to eat somewhere else. It was so nice that they were happy with my “healthier” cupcakes, but aside from the dessert there was all of the other food I had to bring too. 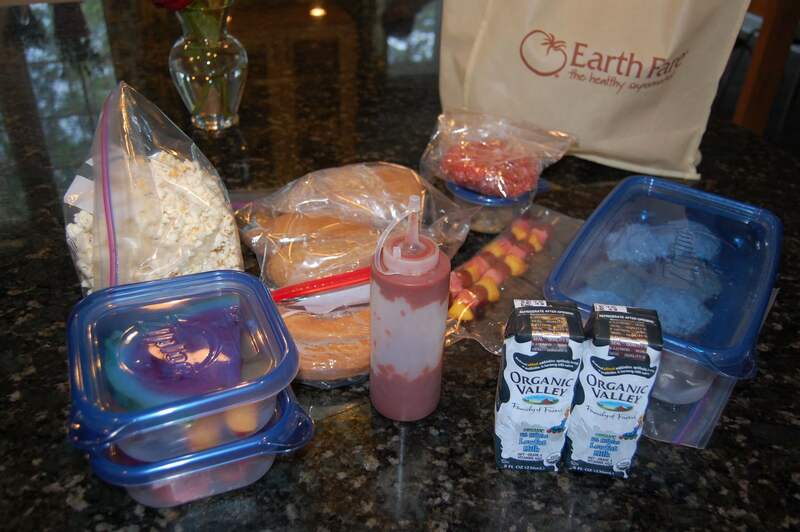 Here you can see a snapshot of everything I had to pack (including the cupcakes, popcorn, hot dogs, hamburgers, whole-wheat buns, fruit, milk drinks, and homemade ketchup) just to ensure we stuck to real food at a party that lasted all of 3 hours! It was definitely a lot of effort and once all of this is over I will have to decide if it will continue to be worth it. I know it seems like a lot of work to eat nothing but real foods, but it’s worth it. Trust me the packaged processed stuff won’t taste the same again. For my daughter’s first birthday party I got a cake made from Earthfare. It’s all made from scratch right there. I decided to do that after calling Bi-Lo and they told me the first ingredient on the cake (which they don’t make there-it’s delivered from somewhere and they couldn’t answer “where” and slathered with icing) was High Fructose Corn Syrup. The cake wasn’t awesome and super sweet compared to the processed cake I’m used to, but it was definitely filling, had no artificial dies (all coloring made with natural products in the store), and my 1 year old loved it. Plus, I didn’t feel too guilty letting her eat it. I will say it tasted like they might’ve put cornmeal in it(every time I ate it it kinda reminded me of sweet cornbread and homestyle biscuits with icing.. odd, I know) but everyone still enjoyed it even though it was very very different then what we’re used to. You should find out what the cake was made with and let us know! Also I agree your taste buds do have to adjust to this new way of eating, but eventually they will come around. Have you tried making your own sugar from sugar beets? I have not tried it yet, but from my reading it *seems* simple enough, and very natural. I have not done that yet, but someone else mentioned it to me as well. I guess I should look into it! Thank you for your comment. I will definitely look into stevia and also the Healthy Indulgences website you shared. And good luck with your nephew! Here are some posts I did on other “treats” you could possibly try with him…. Have you bought the magazine Clean Eating? You would love it….hope you have already discovered it but if not…go get it!! Barnes and Noble / Borders all have it. Contains awesome recipes with less than 5 ingredients and nothing processed. I just found your blog and enjoyed reading. Good luck – even if you don’t stay as strict after 100 days, you won’t go back. Good luck! Thank you for your comment. I bought one issue of Clean Eating from the bookstore, and you are right it was good. I should subscribe! You are to be commended for your determination.My wife and I changed our dietary patterns suddenly and radically about 4 years ago.We have discovered that it is actually cheaper to eat naturally,but it takes time to learn how to shop, cook, and eat.The money we save on doctor bills more than makes up for the money spent on real food.100 days is not enough.Give yourself more time…you’ll be glad you did!! I checked it out and that is interesting…thanks for sharing! Hey! Loved reading the article in the Observer. It is so inspiring – one of the best articles I’ve read in awhile. We are going to try the 10 day challenge soon! I also live in Matthews and love to go to the Matthews Farmer’s Market. In case you didn’t know, Hillbilly Produce Market on Independence Blvd. carries Grateful Growers Pork and Baucom’s Best Beef and Chicken. (local eggs and honey too) My family owns the business and has since 1984. We are all in love with the meat. It is fantastic. I read your entry about Discovery Place food which I thought was great. I never would have imagined they have such great choices. I think you wrote that you had seen Baucom’s Beef before. Does that mean you have never had it?? Just curious… Thought you would have eaten it if you only buy local and shop at Matthews Farmers Market. If you haven’t tried their chicken, it is incredible! Anyway, Good luck! Great job! Thank you for your email and it is so good to find out about you guys! Do you sell Christmas Trees at xmas time? I think I may have seen your place, but have never been there. Now I have a good reason to go! And yes, I am not a huge red meat eater, but when we do eat red meat it is always from Baucom’s Best (we actually had some of their ground beef in spaghetti the other night). Also, I have bought at least 1 chicken from them too, but I also get chickens through or CSA at Poplar Ridge Farm. Thanks again for letting me know about your store! Thank you so much for this wonderful post. As part of a recent 18-month renovation, we focused a great deal of effort on bringing healthy, fresh, convenient fare to Discovery Place’s Community Cafe. We are so glad that a great meal was a part of your experience at Discovery Place. Hi there. I needed to drop you a quick note to show my thanks. I’ve been following your blog for a month or so and have found lots of reliable information along with appreciated the way you’ve organised your site. I will be attempting to operate my own, personal website however think its way too general and I would like to focus more about smaller subject areas. Can you post the recipe for the cupcakes? My nephew is turning one this weekend and I volunteered to make him a healthy cupcake for the party!